"Grey Medal" token, awarded by RandomDSdevel. "Like" token, awarded by MGChecker. 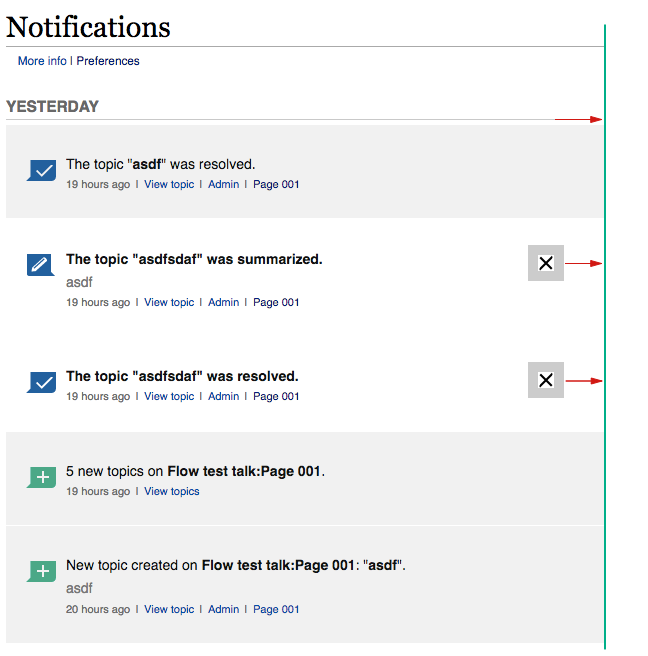 When visiting Special:Notifications, don't mark all notifications as read. Instead, provide controls similar to the ones in the flyouts for marking specific notifications or all notifications as read. 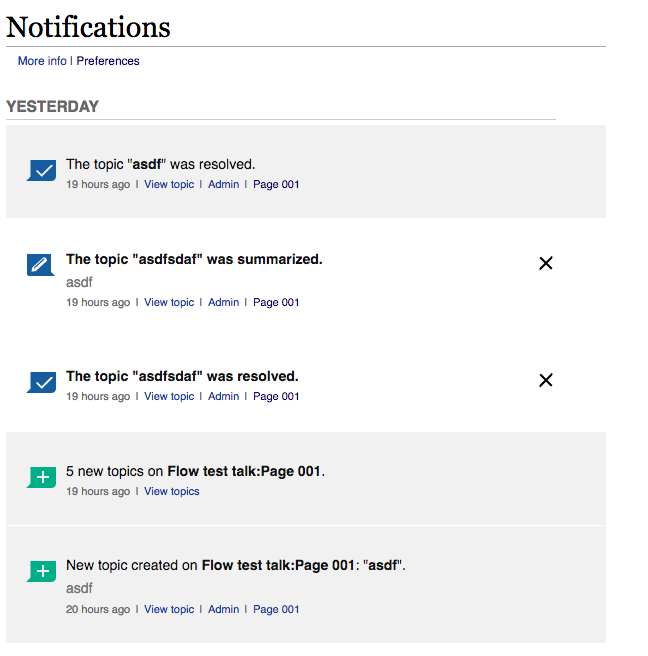 • Mattflaschen-WMF renamed this task from Make "mark as read" an explicit action on current version of Special:Notifications to Make "mark as read" an explicit action on current no-JS version of Special:Notifications. Currently there is no distinction at all for read/unread notifications in the Notification page. 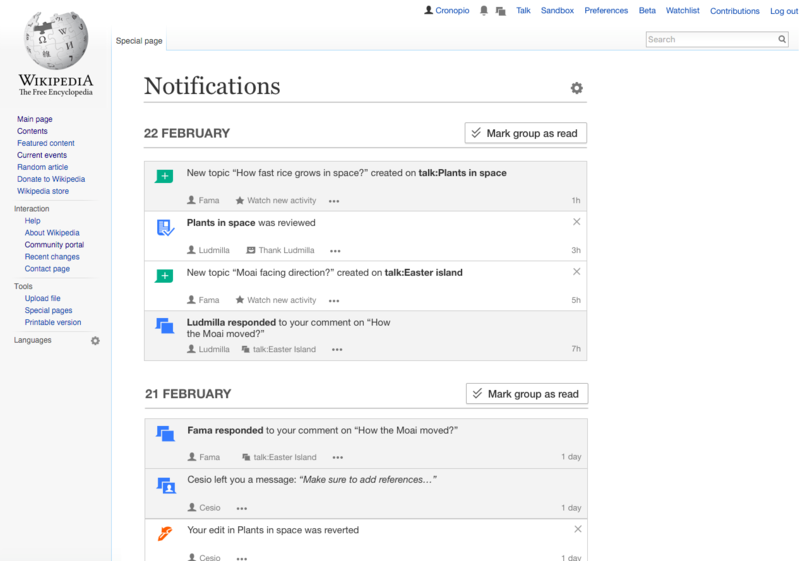 The general idea is to represent notifications as we do for the notification panel. We also have plans (T126214) to distinguish read/unread better, but the result should affect both the notification page and the panel, we should not have something special for the page only. Both should remain consistent. Sorry, yes, at this moment and for the sake of the above gerrit commit, I am only speaking about the no-js experience in the Special:Notifications page. Up until the current patch, all notifications in the Special:Notifications page were automatically marked as "read" because that page automatically marked them as read, so we don't really have a good way of presenting unread notifications. Yes. Thanks @Mooeypoo for all the details! Add the mark as read "X" icon to unread notifications. Add a grey background to the read notifications. Align sections to the left and adjust the unbalanced margins of the notification items now that their background will become more visible. This may be done in a follow-up ticket if more details are needed. Done, done and done. Awaiting review in the patch above. Catrope closed this task as a duplicate of T97057: Visiting Special:Notifications should not mark notifications as read. Catrope closed this task as a duplicate of T96061: Add a "Mark all as read" button at Special:Notifications for no-JS users. This comment was removed by SBisson. 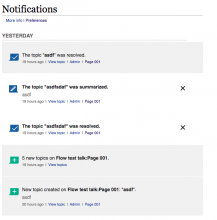 Reopening: this task is about marking one notification as read on Special:Notifications in NO-JS mode. I'm ready to merge this. @Pginer-WMF can you OK the design (or propose changes)? Remember that this is soon going to be the NO-JS experience only. The JS experience should be identical to the flyout in terms of style and layout. Alignment. As illustrated below, it's not visually clear which is the width of the list. By making the line of the daily groups be the same as the Notifications header, and move the "X" icons accordingly. Note that the X should still have some space around it (10px). Contrast of the X icons. The X icons seem too dark, if we could apply opacity in a similar way as we do in the panel (e.g., ~80% initial and 100% on hover, we may want to check the exact approach) it would be less prominent and we could communicate interactivity better. Align sections to the left and adjust the unbalanced margins >of the notification items now that their background will >become more visible. 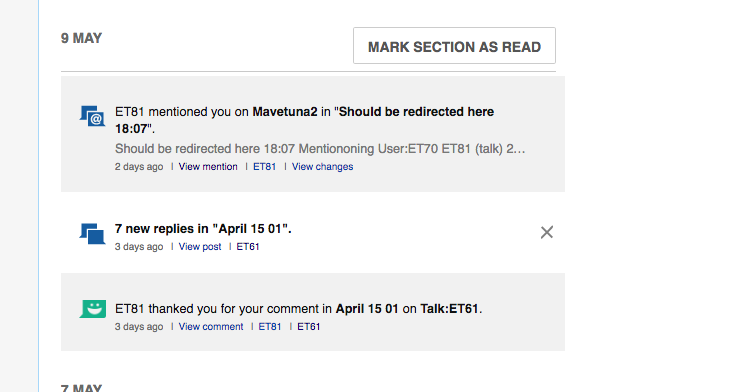 do we really need to display Special:NotificationsMarkRead > page after a user explicitly clicked on 'MARK AS READ' ? What happened to the gear icon? It's not present anymore in betalabs, but it's present in production. Matt is making this happen. Stephane.has a patch for T134204 pending that should fix this. @Pginer-WMF will file a separate ticket for style changes. Bring the gear back with the menu. But, contrary to what it says in the Description above, change the "Notifications settings" item to say "Preferences". There's one outstanding item on this ticket: to bring back the gear icon/menu, as detailed in the Description. NOTE: Contrary to what it says in the Description, in the menu, instead of "Notifications settings" please make the menu say "Preferences". jmatazzoni renamed this task from Make "mark as read" an explicit action on current no-JS version of Special:Notifications to Turn the cog icon into a menu on the no-JS Notifications page. 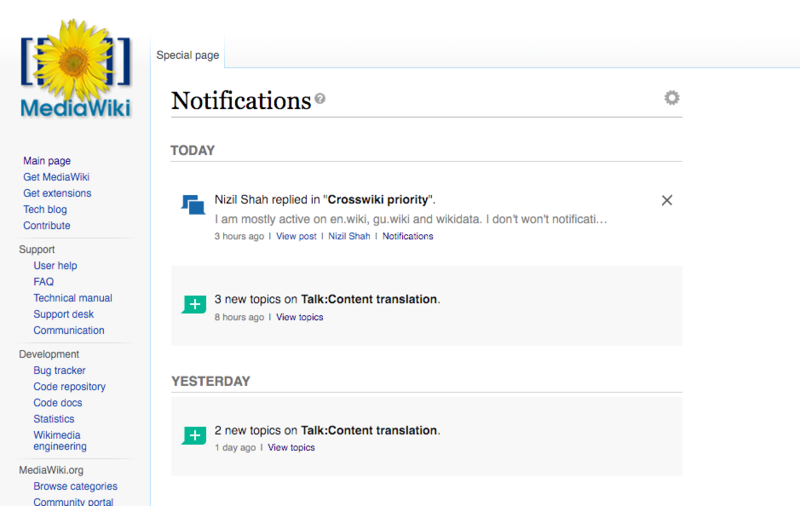 jmatazzoni mentioned this in T129460: Allow to mark as read items and groups in the Notification Page. Just to make sure - this is for the "no-JS" version, correct? The JS version looks and behaves completely differently, and we were discussing adding a different button for mark-all-as-read. My understanding is that this task is for the regular JS-enabled page. Some aspects are already done, other aspects of the mockups are outdated (e.g., the use of the "X" to mark as read was changed by another ticket). The pending parts of the ticket to do consist of replacing the current help icon (at the right side of the page heading) with a menu that provides access to three options: (a) marking all unread notifications from the selected wiki as read (for users that want to start from a blank slate), (b) access the notification preferences (a link that was lost in the process of updating the page) and (c) link to help. In this way we provide access to advanced features without adding separate entry points that distract from the regular activities of checking your notifications. The reason I ask is because the screenshot is for the no-js notifications page. Should we work on this for no-js, js-version, or both? jmatazzoni changed the title from "Turn the cog icon into a menu on the no-JS Notifications page" to "Turn the cog icon into a menu ". From my conversation with @jmatazzoni, my understanding was that supporting this for the JS version was the priority. The reason I ask is because the screenshot is for the no-js notifications page. The mockup was reflecting one of the iterations before filters were added. This is a ticket that was created before those menus were added. Not sure what makes it non-JS. In T115528#2106328 there was a similar confusion. This lead to the creation of T129460 for the JS version, but the cog menu part was also not done there and the current ticker was reused to capture the pending part (which in retrospect, leaving T129460 open may have caused less confusion). When do we show this button? When viewing locally, only when there are any unread notifications (even in following pages?) or only when we see these unread notifications (When we are in a page where those exist) ? What about when we are looking at remote sources? Do we show the button then, and does it mark the remote notifications as all read? If so, it seems a little out of "scope" (it's outside of the filter view) - will it be understood that the 'mark all read' is talking about all notifications in the current source? Or do we just leave it as a local mark-all-read (since that's also pretty disruptive, marking everything read) and do we need to change the wording if so? Does this button marks all notifications as read locally only? Does it depend on specific filters? (If you're in a specific page view, will it mark only those notifications pertaining to that page, or all notifications ever on that wiki?) etc. When we click the button, the notifications list is updated. Do we show the 'loading' animation? If we don't, the user doesn't have any indication for whether the process worked. On the other hand, the process becomes "invisible" in the sense that the user can continue doing whatever they want without interruption from a loading state (the mark-all-read happens in the background). If we do show it, that creates a weird issue where if you have a couple of unread notifications that are not in the current page (so you don't see them) and you click on "mark all read", the loading animation starts, and when it finishes, you see the exact same page. Do we want to change the text of the button? It's a bit confusing. We're using "mark all as read" in the popup, but there we're only marking the visible notifications as read, not all. That usually isn't a problem (according to stats, we don't have many or any users with more than 25 local unread notifications) but in the Special:Notifications page that is actually an issue, because unread notifications can appear in pages that you don't currently see. There was a suggestion to make this slightly more clear by changing the text to something like "Mark all 12 notifications read" which tells the user exactly what will happen. Just a suggestion in my view -- if we are limiting the scope of the button to what we're currently looking at, we might want to consider putting it inside the "main" notification view (where it is clear that buttons operate on the content). Otherwise, I think we might want to change the language of the button, or maybe even use something different altogether for this behavior? 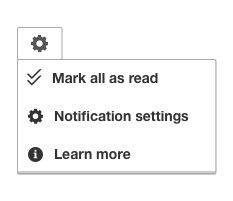 If we end up having a discussion about 'mark all read' we could continue incrementally with the cog menu without it until we solve that usability question. As mentioned in T115528#2404250, the main usecase we want to support with "mark all as read" is for users to start with a blank slate (or "get everything out of the way" as put in T115528#2059395). The action should not be affected by pagination. 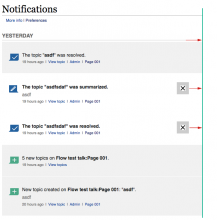 Pagination is a way to view the main piece of information which is the long list of notifications, but the page represents the whole list. Thus, if there are three pages, "mark as read" will have effects in all of them (all items in those three pages will become read). The filters (wikis and pages) should be taken into account. That is, if I select English Wikipedia (even if I'm in a different wiki), all notifications from English Wikipedia (and only English Wikipedia) will become read after I click the action. This involves cross-wiki behaviour in some cases, but it is not much different than selecting a different wiki and clicking "mark group as read" for each group. I think we can also take page filters in consideration. Making the effect of mark as read to affect the items associated with those pages. 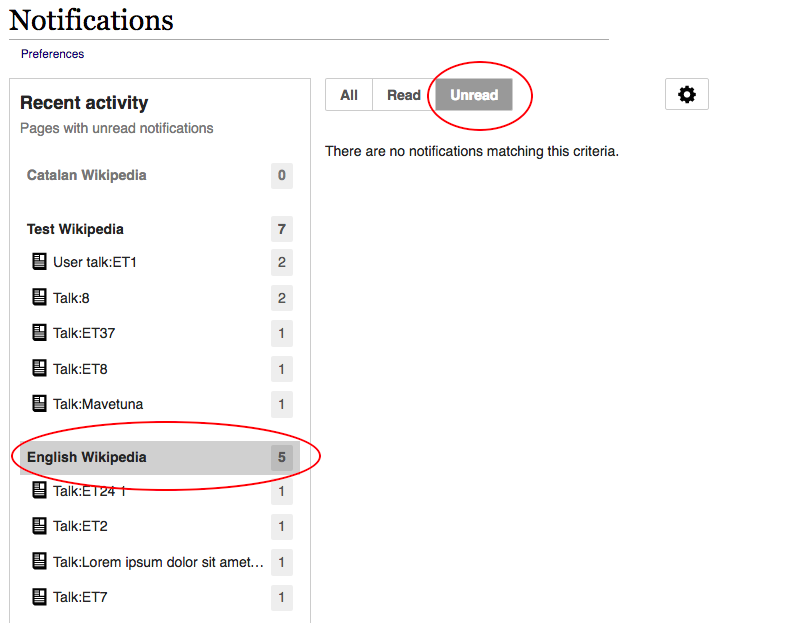 This is not essential, but I think that provides flexibility without limiting the user options: if the user wants/expects the action to affect the whole wiki when a page is selected, she just has to select the wiki and apply the action there (while the opposite case would be more problematic). 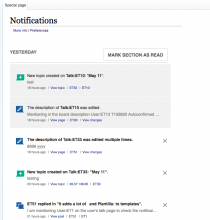 If there are unread notifications in the current view of the user, the user will see the status change. I'm not sure I understand the "loading" comment since clicking the "mark group as read" seems to have the effect immediately on the affected items. This should be the same, but affecting all groups of the current wiki. I don't think we need further notice in terms of the effects of mark as read. 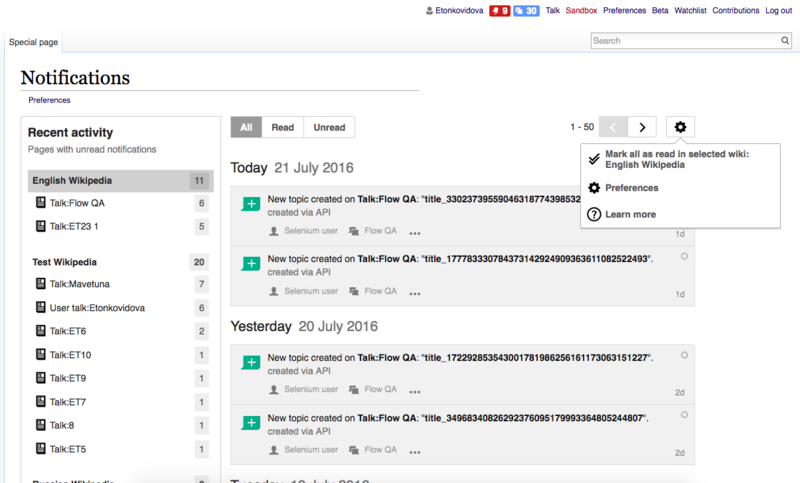 Not so long ago, "mark all as read" was triggered automatically just by visiting the page. So we already added some caution steps to avoid accidentally triggering it. Having said that, I think it's a good idea to surface the number of items affected ( "Mark all 12 notifications read"). Regarding what to do when the action does not apply (because all notifications are read already), I'd suggest to provide the action disabled to communicate that this is possible when it makes sense. In summary: "Mark all as read" is a convenient shortcut to go through all pages clicking the "mark group as read" in just one click. If so, I still think that the button should be inside the main view rather than in the cog menu. The cog menu feels to me to be detached from whatever filters we have, and so the word "all" in mark-all-as-read is confusing. Regardless of that, there's a small technical issue (which we can bypass slightly) -- right now, we can only mark all read entire sections in wikis (remote or local) without regard to page filters. We can probably implement something like this in the future, but it doesn't exist yet. Only when we're not in a page filter ? Or make the text absolutely clear that regardless where we are, this will mark everything in that wiki as read ? I see where we want to go with this and the functionality, but to be honest, I really think this is confusing behavior right now. I think we should consider moving this button elsewhere (maybe even near the pagination and read/unread filters, so it's clear) and/or change its text. Either way, we can start, as usual, incrementally, and check if things work well. It's just a bunch of considerations that I need to verify code-wise, so I want to make sure at least the base behavior is covered so it is implemented correctly. This is a valid point from the information hierarchy perspective. However, this is an action that is expected to be used with very low frequency and it has side effects, so it makes sense to keep it away from the navigation controls the user can click safely in a quick exploration. As an interaction pattern it is also not uncommon to find global actions at the top of the visual hierarchy affected by filters. In Gmail, a similar functionality ("mark all as read") is available under their "more" menu (affecting the items on the selected "folder"). If there are some technical limitations, I don't think we want to invest a lot in this part of the functionality. I'd go with 2. 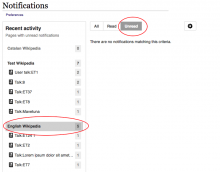 We can make it explicit that the effects are on the whole wiki: "Mark all notifications on English Wikipedia as read", or "Mark all notifications on the selected wiki as read" if we cannot integrate the wiki name. SBisson added subscribers: Trizek-WMF, Zppix. @Mooeypoo, on Beta I see the cog now but I still see the Preferences link underneath the page title. Since that link has been made redundant, I'm pretty sure it's meant to be removed, yes? BTW, I know there is a mockup somewhere from Pau that shows how this is meant to look on a JS page, in combination with page navigation, etc. Can you post that mockup to the page so Elena can use it for QA? Thanks. Checked in betalabs. All functionality that the cog is supposed to do is there. dewiki does not have any notificaitons, so when a user on dewiki will see the cog icon not at the right side of the page. 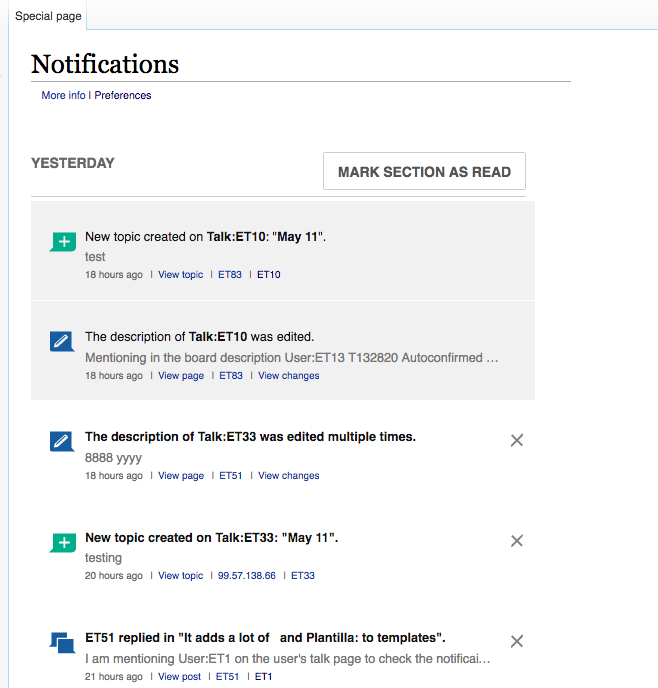 Production - opens in a new tab href="/wiki/Wikipedia:Notifications/FAQ"
3) The side menu counters for unread notificaitons do not get updated unless the page is manually refreshed. And the counters do not get updated even if after doing all of the actions above, a user switches between wikis or the filter tabs. Especially confusing with pageless notifications (see examples in T140842: Special:Notifications: Pageless notifications not present in the list of unread notifications). It might be a good idea to directly signal to a user that the action of 'Mark all as read' is successfully completed which also allows us to refresh the counters. Otherwise, all kinds of confusing page states are presented to a user. when 'Mark all as read' is clicked And the counters do not get updated even if after doing all of the actions above, a user switches between wikis or the filter tabs. Especially confusing with pageless notifications (see examples in T140842: Special:Notifications: Pageless notifications not present in the list of unread notifications). Yes, we should perhaps open a new task (for consideration for the future, perhaps) to get the sidebar to update itself in general. The current "starter" version of the sidebar does not get updated by any user action on the page at all until the page is refreshed. This is mostly because updating the sidebar has some potential UX issues of its own that we decided to solve in the future -- so for the moment, this is expected behavior, but it could probably use a ticket of its own so we can consider the challenges and benefits and come up with the behavior that we want to implement. So, pertaining to this particular ticket - this is expected. The sidebar doesn't update itself at all not just for the mark-all-read button. Thanks for pointing out these inconsistencies in the numbering system Elena. I like the idea of updating the counter at least when the user changes wikis. @Mooeypoo, I take it that is not as simple as it sounds to us layfolk? If it's complicated, I think this all works well enough and we can move on. If there's no reason to keep that redundant link, please remove it. Thanks. I see why you did this, but I think getting rid of the link really should be part of this task. I'd like it to be completed before the cog goes live. @Mooeypoo, can you please remove that link? Or is there more to it than I imagine? Yep, done in the followup commit. 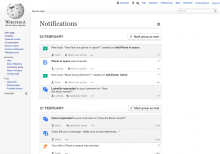 Mooeypoo added a subtask: T141141: Notifications page: remove mw-echo-special-header-link.